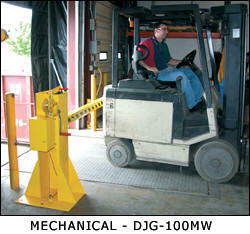 This electric hydraulic dock barricade represents the next generation of innovative loading dock safety systems. Unit is simple to operate, push the up button or down button to perform the operation that is desired. Ergonomic electric lift design provides quick and effortless operation. Robust 1hp motor, pre-wired for 115volt, and 24volt control are just a few of the fine quality attributes. Installation is virtually effortless, simply lag the unit to the floor and plug it in.